Obviously there is no doubt that before we register as a publisher on a PPC program, the first thing we really want to know is how much revenue would be paid if someone clicks on an ad on your blog or on our website. Especially for Google Adsense ads, the value per click is uncertain. the value of the lowest cost for all its click is $ 0.01 and the highest value ever obtained by a person is $ 30, the highest click costs personally I ever could is $ 0.25. many things that can affect the amount of cost per click on Google Adsense ads. one of them and most said by the masters of this field is the influence of keywords in every article we write, the more expensive keywords that we put the ads that appear in the article would be expensive anyway. Placement of AdSense ads on the blog may also affect the value per click advertising, blog theme usually also greatly affect to the high and low cost-per-click advertising Adsense. for example, the topic of the machine, health, and about the economy. 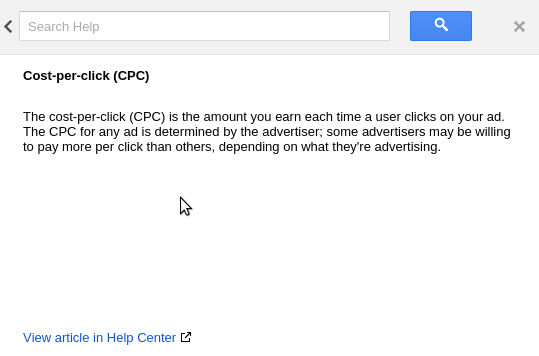 So first my description of the value per click on the Adsense ads, hopefully this article can be useful to the reader.